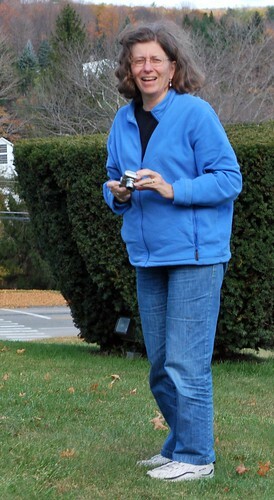 Way back on October 23rd of last year, Princess Patti of Ansonia in the Valley and I got together on a sunny Saturday with beautiful blue skies and tolerable temperatures to explore a bit of Northwestern Connecticut. The object of our adventure was to ferret out and photograph some foliage before it was gone for another year. Patti, a blogger whom I have had the pleasure of getting together with in real life several times, lives a little over an hour away from me just a bit past New Haven and much closer to the northwest hills so it made sense to meet at her royal residence and venture forth from there. Her loving spouse who is also a blogger, Prince Ralph, had prepared a list of places for us to check out so we set out with his list, a partial bag of donuts, and my GPS unit to see what we could see. In addition to being an ace reporter for the New Haven Register, Patti is also a professional passenger as her Prince is usually in charge of operating their royal carriage whenever they traverse the countryside so I put her in charge of directions as we headed out of Ansonia. Along the way she pointed out sites of interest in her town as well as a few of the surrounding ones as I got a chance to see parts of Connecticut that were new to me. I've got a lot of pictures of our journey to share but for today I thought I'd just post pictures of some of the "quintessential white clapboard New England churches" that we found along the way. There might not have been much for foliage but in New England, you can always find a nice church or two to take pictures of! 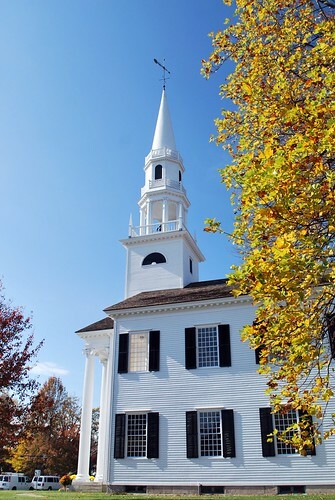 Our first stop was this beautiful 1829 meetinghouse which is the First Congregational Church of Litchfield located - not surprisingly - on the Litchfield Green and part of the 1959 designated "Old and Historic Litchfield Historic District". Sounds a bit redundant, huh? 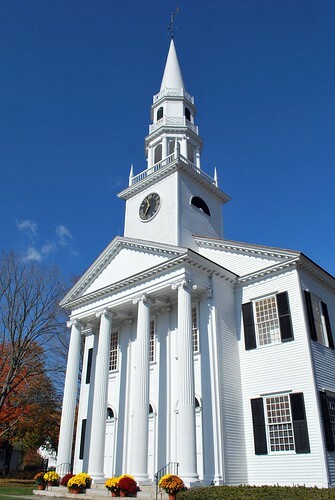 A special act of the Connecticut General Assembly designated the entire borough of Litchfield as an historic district giving it the rather redundant name above - the first such district in Connecticut. On November 24th, 1968, a central portion of the borough was given National Historic Landmark status as "Litchfield Historic District", and on November 29th, 1978, the entire borough was listed on the National Register of Historic Places as an historic district. So see? 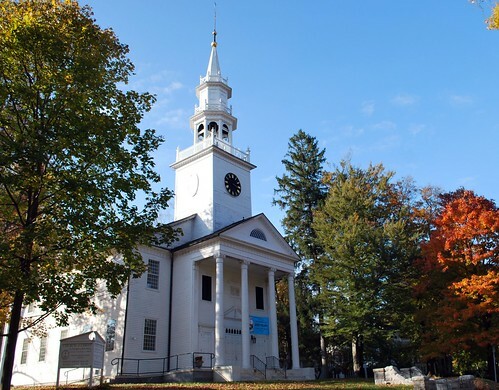 It wasn't just Connecticut that thought Litchfield was historic - the bigwigs in Washington did, too! The next church we stopped at (where the picture of Patti at the beginning of this post was unknowingly taken!) 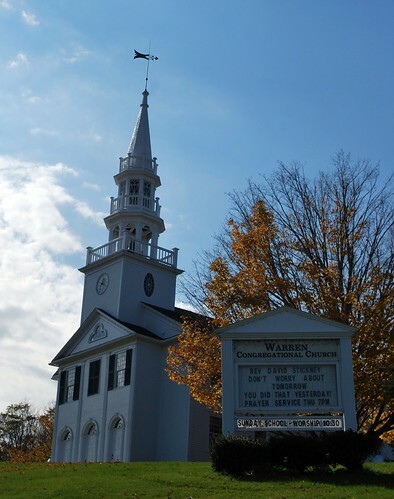 was the Warren Congregational Church whose motto is "Loving hearts, serving hands, growing faith". 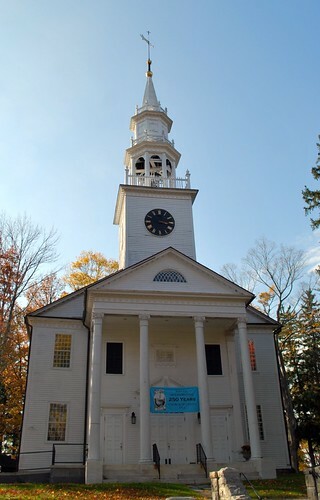 The Warren meeting house was built in 1818 and added to the National Register of Historic Places in 1991. Unlike Litchfield, I don't believe that the entire town of Warren was, though! 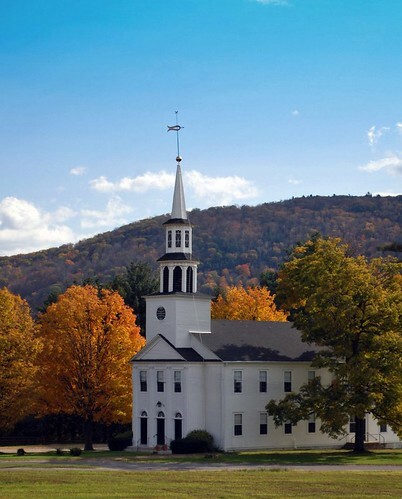 Continuing through the northwest part of the State, we came across the North Canaan Congregational Church which is actually located off of Route 44 in East Canaan and not all that incredibly far from the Massachusetts border. I believe the meeting house was built sometime around 1822 or so but I was able to find darned little information on the church! Maybe someone from North Canaan or East Canaan or just Canaan in general will stumble across this post and enlighten me a little bit! The last white-spired meeting house that I took pictures of is the Norfolk Church of Christ Congregational located on the green in beautiful Norfolk, a very lovely town that I'm pretty sure I'd like to visit again! 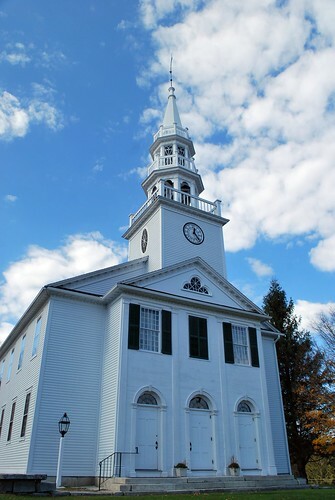 The current meeting house was completed in 1814 to replace the original 1770 meeting house which stood on the same spot and was too small to hold the growing congregation. 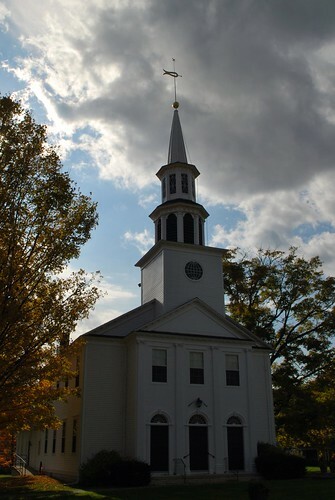 As you can see from the blue skies surrounding the white spires of all the churches we spotted, it was a beautiful day in spite of the fact we weren't finding too much foliage to speak of as we wandered through rural Connecticut. Even with the lack of color though I, for one, had a lovely afternoon and I'm pretty sure that Patti did, too. We even got to one of Connecticut's few historic covered bridges and I'll be posting about that soon - just give me some time to finish getting the photos together! I knew you would be getting to this post eventually. You'r always so thorough with local history - that's why I didn't post many of my photos. I left it to the expert. You did leave out that NYC dentist's former bungalow, or whatever it was on top of that hill. I guess I could focus on that part of the trip! 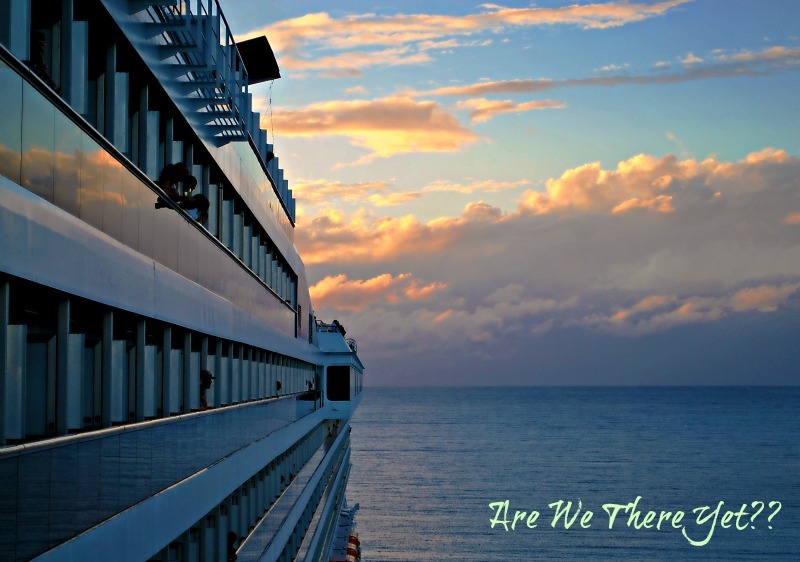 Remember how we were straining to see Vermont? I had a great time. I bet the Northwest hills look lovely in white, but I'll wait until spring, or maybe next fall to return. What a great adventure indeed, and a partial bag of donuts? You just can't beat that. I was waiting for lunch though, but I'm always waiting for someone to tell me what they had for lunch/dinner. My favorite photograph is number six. You have a lot of fall in that one. Just jumped right out at me. You have captured the delightful essence of the ladies trip, the duchess and the princess! a partial bag of donuts... hahahaha! Love your steeple chase! New England has the prettiest architecture, at least that's my opinion. My favorite shot is the one with the hills behind it and some lovely orange-y fall colors surrounding it. Gorgeous! You two need to plan a winter trip and photo these same churches, snow covered:) Your header is beautiful, especially when viewed in the comfort of sunny WPB! I love the big white churches. All so picturesque!!!!! it's nice to finally "meet" Princess Patti! awesome you got to meet Patti--beautiful photos, Linda. Have a great week!